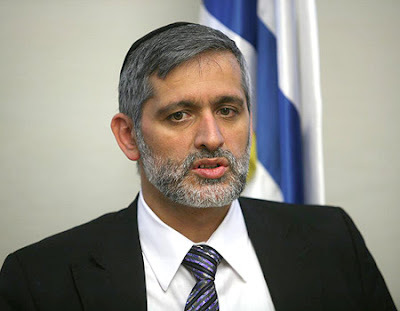 TEL AVIV, Israel -- Interior Minister Eli Yishai boycotted Tuesday a debate by the ministerial committee appointed to approve a visa agreement between Israel and Ukraine. In response to Yishai's claims that Ukraine is "a source of prostitution and human trafficking", a representative from the Internal Security Ministry presented a report to the ministers according to which just two women of Ukrainian nationality were arrested on suspicion of prostitution this year. The representative also reported that not a single Russian woman has been arrested for such an infraction, despite an agreement with Moscow eliminating the need for visas between Russia and Israel. Foreign Minister Avigdor Lieberman was present at the debate, and reported progress made on the matter with Ukraine. He said a draft for the deal had already been completed and would be presented to the ministers within two to three weeks. Internal Security Minister Yitzhak Aharonovitch told the ministers he had begun the process under debate three years ago, as tourism minister. "There was unanimous objection," he said. "After a few meetings data was gathered showing that the fears of a mass migration of prostitutes due to the cancelation of visas were unfounded, the results began to speak for themselves." Aharonovitch added that the number of Russian tourists had multiplied by five since the deal was in place. "It's hard to argue with such results," he said. Tourism Minister Stas Misezhnikov said at the debate that the Ukrainian government sees the deal with Israel as one of its major goals. Yishai, who has previously rejected the visa proposal on the grounds that it would cause an influx of criminals and prostitutes, issued a statement saying that he chose not to be present at the debate because it was being held without the necessary participation of the head of the Immigration Authority, Amnon Ben-Ami.